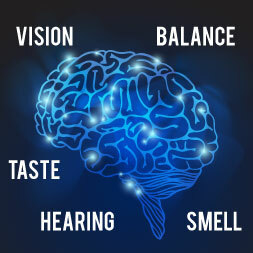 Learn more about the human sensory organs. Human sensory organs such as the eye, ear, nose and tongue are central in the processing of sensory information from all the stimuli that bombards the body continuously. Without sensory organs we would not be able to make sense of our environment and surroundings. This free online course enables the learner to explore the functions and structure of the human sensory organs. It outlines the different special senses such as vision, hearing, balance, smell and taste, and their corresponding receptor organs such as the eye, ear, nose and tongue. It also explains the different reflexes associated with each of these senses.The free online course will be of interest to students of biology, physiology, anatomy and medicine, as well as healthcare professionals who would like to gain a basic knowledge and understanding of the human sensory organs.